Christmas is here! It’s the best time of the year…! 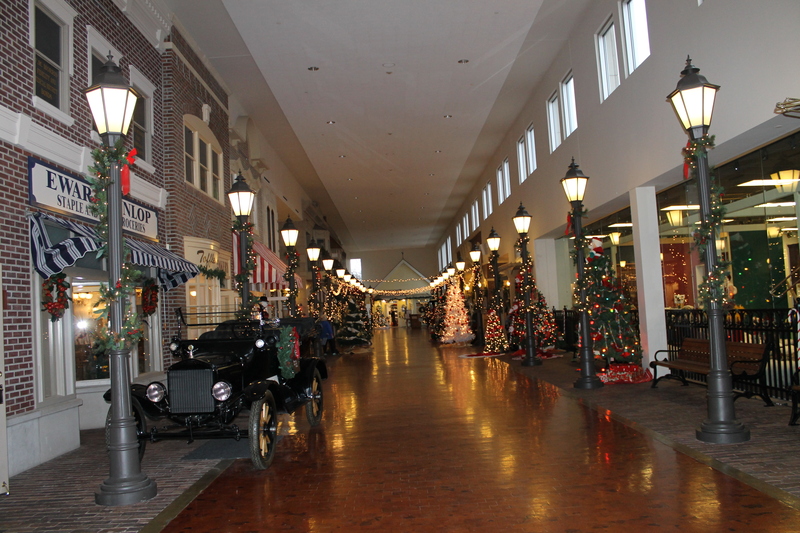 Explore all that Mason City and the North Iowa area has to offer during this holiday season. The celebration continues at the Music Man Square, November 18-December 30. The Holiday display, open Tuesday-Sunday from 1pm-5pm (closed Mondays and holidays) features a beautiful holiday decor and music by composer and Mason City native, Meredith Willson. Admission $10 adults, $5 students, children 6 & under free. Celebrate Downtown Mason City! 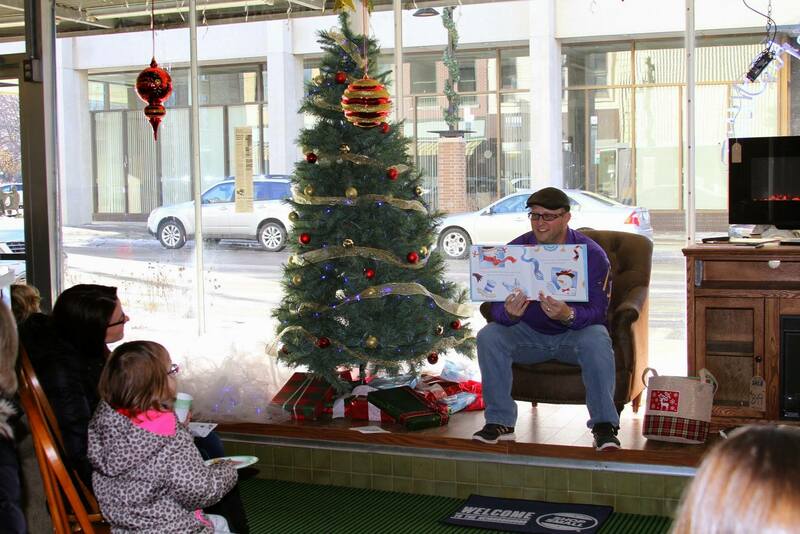 Main Street invites you to bring the family and enjoy cookie decorating, storybook readings, letters to Santa and much more on Saturday, November 25. The celebration is from 3:00pm – 5:30pm with the Lighting of the Tree Ceremony at 5:15pm – PLUS, if you’re a youngin’ enter into the drawing to be the official Tree Light Operator! THEN – If you’re 21+ stick around for the Jingle Mingle Bar Hop from 5:00pm-8:00pm. The $5.00 cost gets you a shot glass necklace and a bar hop map; each location will have a drink special for those participating! 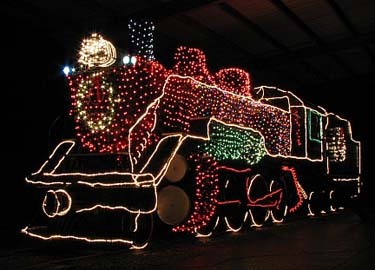 Friday, December 1st at 5:00pm the Cannonball 457 will transform into the ‘Holiday Cannonball’ dressed in its full holiday attire, complete with over 500 Christmas lights! 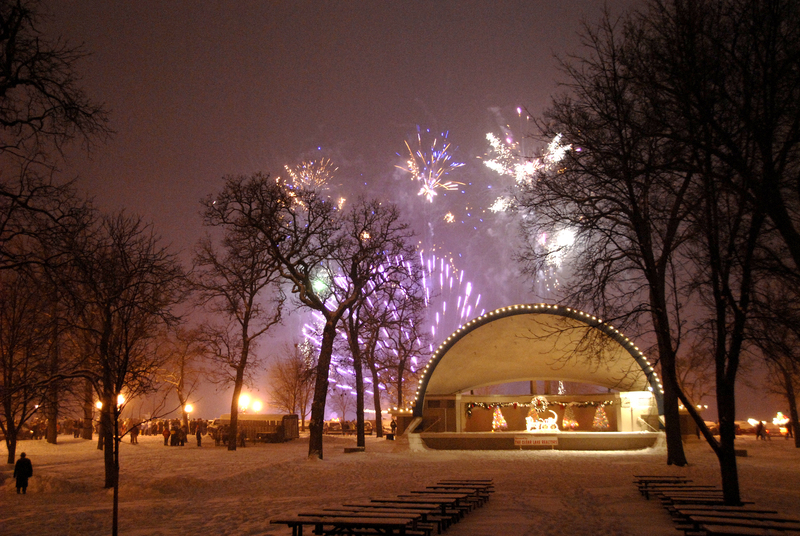 You can find the Cannonball 457 year round at Mason City’s beautiful East Park, located at 717 3rd St. NE. 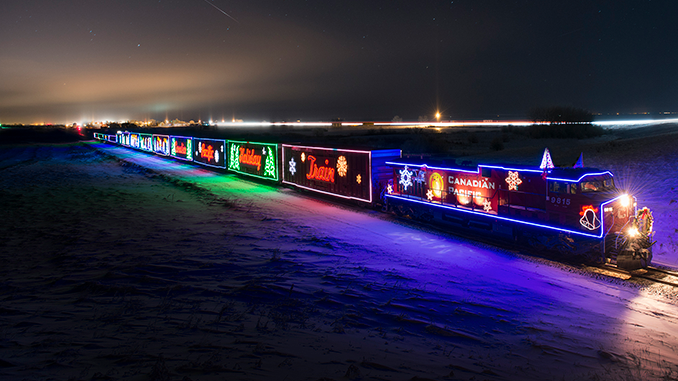 The popular Canadian Pacific Holiday Train will make a cheerful stop in Mason City on December 6th at approximately 7:45pm at the C.P. Depot, 904 South Pennsylvania Avenue; special performances by Terri Clark, Dallas Smith and Kelly Prescott will take place from 8:00pm to 8:30pm. The Holiday Train each year travels across North America collecting food and monetary donations to help restock food banks in an effort to give those in need access to healthy food. There are no admission costs; however, they encourage monetary or food donations be given to the local food bank, food bank reps will be on site. The Holiday Train is about 1,000 feet in length with 14 brightly decorated rail cars decked out with hundreds of thousands of technology-leading LED lights and designs. Once the train arrives, they will pull into a safe stop in front of the crowd, the stage door lowers and the band will open with its first song. Then, a brief presentation takes place with local food bank officials, once completed, the band continues. The band will perform a mix of traditional and modern holiday-themed songs. Nothing means more than a homemade gift to a family member, friend or a significant other – bring your favorite photo and learn a cool method of transferring a photocopy onto wood. The Charles H. MacNider Art Museum, Christmas Photo Transfer Workshop is November 18 from 9:00am-Noom. The cost to attend the workshop is $22 for members and $29 for non-members. Also, join the MacNider for two signature holiday events, Holiday Off the Clock and Open House. MacNider Off the Clock, December 8 from 5pm-7pm is free and open to the public. Enjoy complimentary wine and appetizers, live music by Sam Crosser. Visitors are invited to mingle with one another as they explore the galleries of the MacNider in the relaxed atmosphere. The next day, the MacNider invites you back (December 9) for their Holiday Open House from 1:00pm-4:00pm. Filled with children’s activities, young artists will be able to participate in a variety of make-and take activities throughout the museum. Children will also have the opportunity to meet with Santa Claus. Celebrate with our neighbors, just down the road in Clear Lake for their annual event – Christmas by the Lake! Join in the fun all around Clear Lake December 2 & 3 – Saturday, will include a horse drawn carriage and Main Street Trolley rides, craft show, petting zoo, visit with Santa, lighted parade, fireworks over the lake and more! 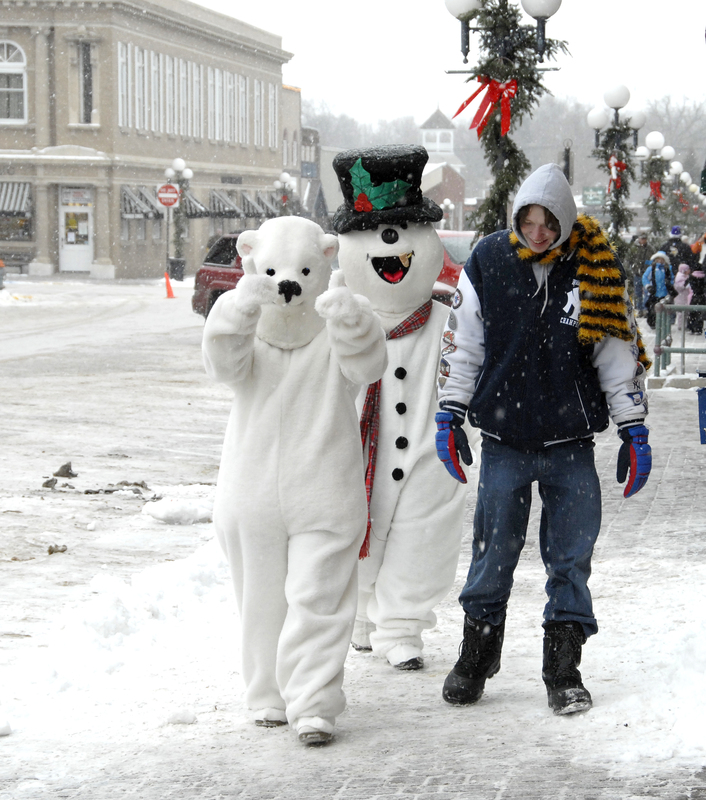 Sunday brings the Kids Treasure Hunt, a free matinee at the Lake Theatre and the famous, Polar Bear Dip! The Polar Bear Dip at City Beach in Downtown Clear Lake draws a crowd of over 500 brave swimmers, who jump into the icy water to raise funds for charity. The Polar plunge is from 12:30pm-2:00pm; registration starts at a $40 donation. Turn on the Lights for Opportunity Village’s Lights On 5K, November 30th; walk or run in your holiday costumes and lights! All proceeds go to purchase Christmas gifts for clients in need. Race starts at 4pm, start/stop location at The Other Place Restaurant; admission: $20 early registration (includes a t-shirt), $25 late registration (no guarantee of t-shirt). Opportunity Village celebrates all weekend long (December 1-3) with their annual event, Festival of Trees, featuring over 100 trees and wreaths decorated and for sale. 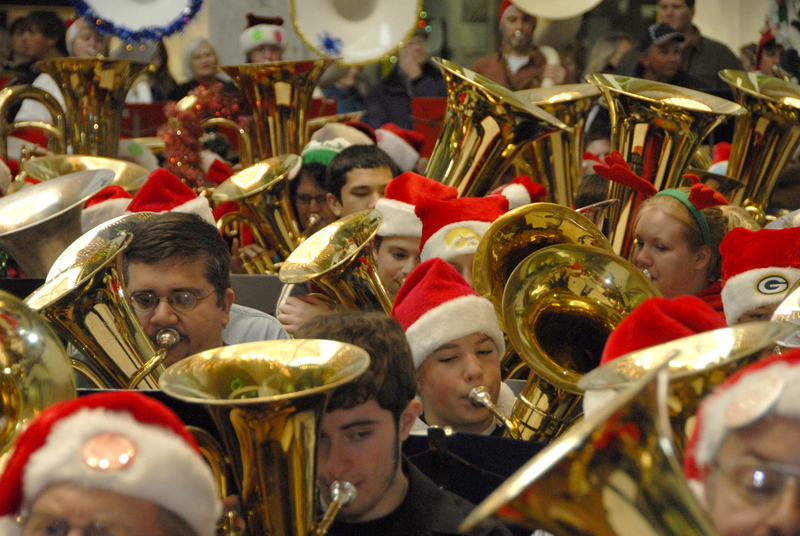 Listen to all of your favorite Christmas Carols performed by (over) 100 tuba, Sousaphone, baritone and euphonium musicians from across the state. Performance takes place December 9th at the Southbridge Mall, beginning at 1:00pm. Get your Tickets, and Lets Go! There’s no better way to celebrate Christmastide than seeing with your own two eyes. Enjoy theatrical performances in Mason City! Stebens Children’s Theatre kicks us off with a performance, “Best Christmas Pageant Ever!”. Shows are shown December 1st -10th; Wednesday & Thursday 7pm, Saturday 5pm & 7pm and Sunday 2pm. Tickets are $13 adults and $10 youth 18 and younger. Tickets may be purchased at the box office, open weekdays 1pm-5pm. Grammy® Award-winner Chip Davis has created a show that features Mannheim Steamroller Christmas classics along with a selection of compositions from his ground-breaking Fresh Aire series which introduce the distinctive Mannheim sound to America. Experience the magic December 19th, as the spirit of the season comes along with the signature sound of Mannheim Steamroller! Show times: 4:00pm & 7:30pm, tickets start at $30. December 2nd – Bring the family, get a sweet treat and receive a professional Christmas photo with Santa taken by Love & Luck, courtesy of CENT Credit Union (25 West State St.) – 9:00am-Noon. December 2nd, 9th, 16th – Get your camera out and catch Santa at the Willowbrook Mall (1631 4th St. SW) Sundays in December from 11:00am – 1:00pm. Looking for more holiday events? Check out our calendar of events or submit your event to us and we’ll share!